The winner, with roughly the expected share of votes and mandates (14) is the more populist and popular EPP party Fidesz with 56,4% of the total votes cast. As expected, the centre-right MDF, with the spectacular candidate Lajos Bokros, a liberal former maverick finance minister has jumped the 5% treshold and got MEP, Mr Bokros with 5,3% of the total votes cast. (Former post on the Hungarian EPP candidates). 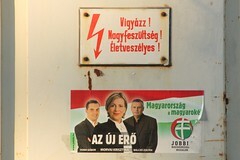 The great surprise of the election is the unexpected rise of Jobbik, a new-ish far-right party that has managed to galvanize the rural and the capital far right vote, with a bit of anti-Gypsy rhetorics in the villages and anti-Semitic one in Budapest. Their 14,8% exaggarates their importance, the 460 thousand votes they received is not far more than the usual far-right, altough fractioned far-right vote. However, their extraordinary good results gave them 3 MEPs and also they can claim that no party since 1994 came that close to the big parties, Fidesz and the Socialists. The left-wing result are much worse than expected in the polls. The Socialist party, which has received the most votes in all national elections since 1994 and was left out from power only by a three-party right-wing coalition between 1998-2002 received 17,4% and was beaten in many districts by Jobbik. Their result will sooner or later undermine the hugely unpopular Socialist minority government. The Liberals, who exited the unpopular Socialist-led coalition did not meet the 5% treshold. Their party, the Free Democrats received 2,2%, their worst-ever share of votes. The party, which was the second biggest in the first democratic elections in 1990 and has been more or less the balancing party in the Hungarian politics ever since seems to have lost almost all influence. Surprisingly, they new Green party received 2,6%. They have taken over a lot of protest votes from Liberals as they have received their best results in the former Free Democrat strongholds. Their party, LMP (Politics Can be Different) is a coalition of greens and liberal NGOs. The Communists, who ruled the country between 1947-1990 with Soviet-Russian troops behind them had never made it into the national parliament on a democratic vote. Their 0,97% is what they could expect. I personally endorsed a Roma party, MCF Roma Unity, that hoped to give a democratic answer to the frightening anti-Gypsy far-right agenda. However, they received only 13,440 votes or 0,47% of the vote. Exptect racial motivated violence and murder in Hungary. The Hungarian EPP actually gained seats from 4 parties in the region. The party of the Hungarian minorities in Romania and Slovakia, due to their threatened and disciplined voter base has gained 4 and 2 seats in Romania and Slovakia, receiving 14 and 10% of the votes in their countries. This way the EPP can claim that although Hungary has 22 mandates in the EP, it caught 21 from Hungarians. Thanx so much!!! this is the clearest overview of the elections that i am able to find out in English in the net.